Video game to movie adaptations have a rocky track record, to put it lightly. Some of the earlier film adaptations of games – such as Super Mario Bros. or Street Fighter – at least had something of an excuse for their less-than stellar quality, seeing as the idea of bringing the worlds of video games to life on the big screen was new territory back then. And it’s not like most games at the time were built around compelling narratives that could translate easily into the world of cinema. But as the years went by and video game-based movies continued to be… not good, even as games became more movie-like themselves, the sub-genre of video game movies grew to become something of a joke. It’s as if some curse simply prevents video game movies from being good. The curse is alive and well, evidently. Because, despite some charm and humor, the Ratchet and Clank animated film isn’t that good. And this is a series that’s been begging for an animated film since its inception. That’s not to say that Ratchet and Clank is as bad as many other video game movies that came before it, but taking into account the colorful worlds, characters and humor of the series, the end result of the movie is a shallow letdown. Ratchet and Clank tells the story of, well, Ratchet and Clank. The former is a cat-like alien called a Lombox, who works at a vehicle repair shop on a desert planet, while the latter is a small and charming robot who serves as the brains of the duo. An evil organization known as the Drek Corporation has been destroying uninhabited planets, under the leadership of its chairman and CEO, Drek. Drek is working with a mad scientist, Dr. Nefarious, and a musclebound robot named Victor. Together, they make up the film’s triumvirate of villains. With the aforementioned planets getting destroyed, the galaxy is in a panic, worrying that an inhabited planet could be next. So the galaxy-protecting Galactic Rangers (lead by the hammy and dimwitted Captain Qwark) are looking for a new recruit to help them take on this new threat. Ratchet, being a big fan of the Rangers, seeks to be their new recruit, but is quickly rejected. This of course leads to the predictable “follow your dreams amid disappointment” bit that – while certainly a good message for young audiences – seems to be the go-to message in animated flicks when the filmmakers can’t think of anything else. Eventually, Ratchet meets up with Clank, who has escaped Dr. Nefarious’ robot factory. The two become fast friends, and prove to be a good enough heroic duo that they end up getting recruited by the Galactic Rangers. That’s when the adventure to stop Drek gets going. It’s not that the story is inherently bad, but it lacks any shred of surprise and innovation. The plot basically follows all the same, predictable beats you could imagine from both animated movies and the sci-fi genre. What’s worse is that the film basically only captures the most simplistic and on-the-surface qualities of its characters. 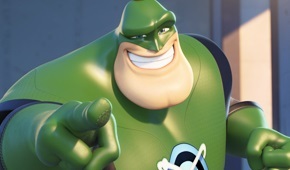 While Clank is charming with his intellectual quips, and Captain Qwark is humorously cheesy, Ratchet, the film’s main character, can basically be summed up as “the main character.” The rest of the Galactic Rangers are so forgettable you may forget that they’re there, and the villains, while not without their funny moments, basically just fill the roles of villains. Worse still is that, despite this being the Ratchet and Clank movie, it feels more like the Ratchet and Captain Qwark movie, since Ratchet and Clank don’t share a whole lot of screen time together, which makes the titular relationship feel squandered. Meanwhile, Qwark seems to hog the screen at the expense of Clank. The movie’s sense of humor also feels a bit dumbed-down, with perhaps too many jokes built around texting and Twitter. There are a few jokes that land (including a few references to other Playstation franchises like Jak & Daxter and Sly Cooper, as well as some fun subtitles that go with the traditional on-screen names of locations during scene transitions), but most of the humor feels like it’s trying to be hip with the Twitter generation. In terms of animation, the film looks capable, though not exactly impressive. It’s pleasing enough to look at the cartoony character designs and colorful environments, but it also doesn’t exactly look up-to-date when compared to a lot of other animated features of today. Thankfully, the film has some great voice work, with many of the voice actors from the games reprising their roles, as well as a few celebrities thrown into the mix. Paul Giamatti voices Chairman Drek, while Slyvester Stallone fits as the lumbering Victor. Best of all, John Goodman has a small part as Ratchet’s boss and mentor at the repair shop, and John Goodman vocals are only ever a good thing. Ratchet and Clank is ultimately an uneven movie that’s hard to recommend. Young children will probably have fun with it, and perhaps some diehard fans might simply enjoy the titular duo finally making it into a movie (though one can also imagine fan disappointment as well). But for everyone else, the story is too predictable, the humor too inconsistent, the characters too shallow, and the overall execution too uneventful to be anything more than another disappointing video game movie. I was disappointed to see the movies reception, which didn’t even get mediocre, but just plain negative. At the very least I hear the reboot is pretty good, which is a relief given the series was losing some luster on PS3, a Crack in Time being the sole really good title of that gen. The reboot was a really, really good game, but that’s just it. Playing it was a lot of fun, but listening to it tell its story was not. The characters were not written very well, like the writers were worried about driving too much attention away from Ratchet, whose relationship with Clank felt rushed. Like they just took it for granted that these guys were friends even though the reboot essentially started the story from the beginning. A lot of the humor fell pretty flat too, particularly Insomniac’s weird habit of making fun of stereotypical nerd stuff. They did the same thing in Sunset Overdrive, and it felt more tone-deaf and awkward than self-deprecating. Gotta reiterate, Ratchet and Clank (2016) was great, but the movie looked like it took all of the game’s worst elements and expected them to carry a 90 minute movie. Previous Previous post: Zelda Wii U. All Alone at E3.